The problem space started with volunteering and recruitment: Canadians (21-35 years old), lead busy lives. They have good intentions of helping their community but find it hard to make time for themselves, let alone making long-term volunteer commitments; priority is placed on having a balanced schedule outside of work. 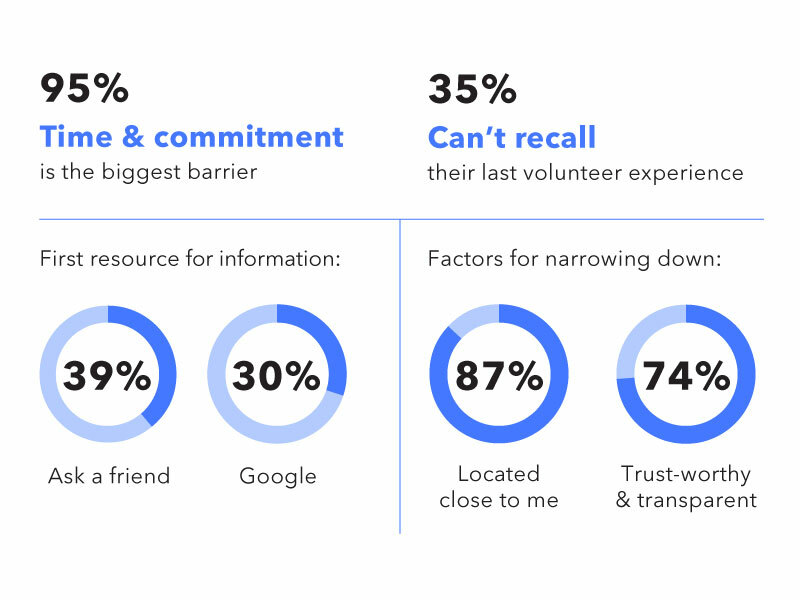 A survey from Statistics Canada showed that 67% of Canadians don’t volunteer because they don’t have enough time, and 62% can’t make a long-term commitment. Ripple a scheduling app intended for busy Canadians (21-35 yrs) search, sign up and volunteer for one-time, non-profit run events. This helped reconfirmed my problem statement, and guided the process for a user persona and user flow for my wireframes. The persona “Busy Helper” was a combination of quotes from user interviews, and results from the survey. The portion of the user flow above shows consideration for custom filters and searches. Developing a user flow and initial wireframes was the most challenging and rewarding part of the process. It’s easy to get lost in your own idea of the app, and I learned quickly to test often, and be specific about what you’re testing for. Between the first and second round of wireframes, a lot of copy and UI elements were created specifically to give enough context for user testing. I gave each participant three tasks to complete using a mid-fidelity design through InVision. Figuring out a functional layout for the event details screen. The first set of wireframes; the language and UI needed improvement after initial tests. Changes made to the second set of wireframes proved successful in user testing. There was a lot of excitement for this app as I was testing the prototype with participants. It was amazing to see people genuinely excited about volunteering, at whatever capacity they could. This led to the concept behind the logo and visual identity of Ripple: every action counts, and those actions create a larger, deeper effect than any one person. Ripple’s design is playful at heart, and uses a limited colour palette with endless hues when multiplied on top of each other. This project taught me so many fundamentals of design thinking and user experience design. Some aspects I found challenging but rewarding: interviewing participants with empathy and a qualitative intent, collecting and distilling my own data, expanding my understanding of good UI practices, and branding the app with full creative control. looking at the process after a volunteer experience (ratings, social media, etc). You can read about the process in full detail, or try out the prototype I used for testing.